We have six core values at the Fool, and everyone has their favorite. Mine is “Have Fun: Revel in your work.” To that end, I helped orchestrate an afternoon of fun last April with our first-ever hamburger-eating contest. At a lot of workplaces, the challenge when putting on “cultural” activities is trying to generate interest and participation. Office sitcoms are littered with episodes where the well-intentioned CEO tries to do something “fun” for the staff but fails miserably. Here, we have a different problem: we have to top what we’ve done in the past. Cultural events at the Fool have run the gamut for years – from field day events to ping pong tournaments to Chili Cook-offs. So the challenge here is to stay original and deliver an event that lives up to Foolish fun standards. For all of our antics, no one had ever tried competitive eating at the Fool. It’s messy, gross, and possibly even a little dangerous. But throwing caution to the wind, my collaborators and I decided to go for it. We ordered 100 hamburgers from McDonalds and sought out Fools who’d be willing to put their waistlines on the line. We approached three or four Fools privately about entering the competition. When they agreed, we knew we had a critical mass. We sent an e-mail out to the entire company advertising the event and soliciting further entrants. Ultimately, we ended up with seven participants. The event had prize-fight atmosphere. We had over 100 Fools show up to cheer on their colleagues, and everyone in attendance seemed to have a good time. 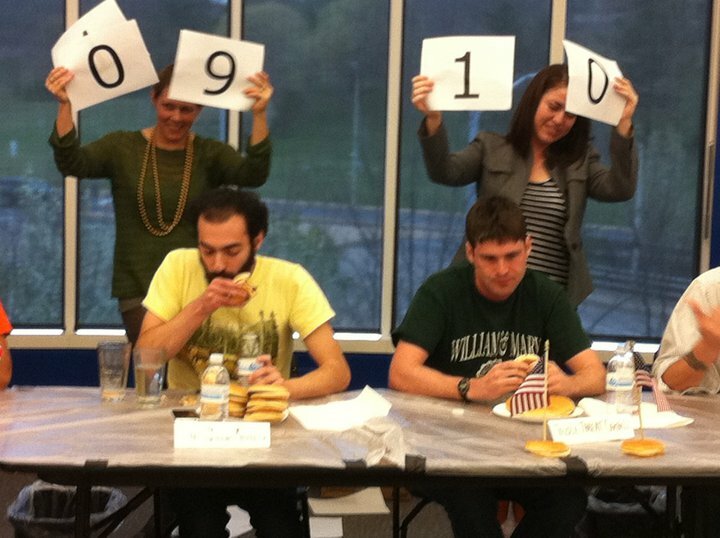 The winner inhaled 10+ burgers in 10 minutes, while the runner-up came in at 10 flat. Gross as it may sound, the highlight of the event came when the Fool in first place at the time tossed his cookies (or patties) with about a minute and a half to go. He’d downed too much water with his burgers, I suppose. After the event was over, one of our executives called it a “moment we’d remember and share at cocktail parties forever”. Thinking back, I come up with three reasons why it worked out. 1) Make participation easy. We only had seven burger-eaters, but half the company turned out for the event. The Fools that took time out of their days to watch are the ones who made the atmosphere so much fun. Anyone at the company who had the time was able to hang out, cheer people on, and share some community with their co-workers. 2) Find the right champions. Most of the folks we picked to eat were good-natured, long-tenured employees. Each person had his own cheering section, which raised the excitement level in the crowd. In any cultural event, you have to get your champions on board first. 3) Pick a proper time. It was Friday around lunch. It’s easy for people to take a break when they’re already accustomed to doing so. It set the tone for the afternoon, and got folks ready for the weekend. Cultural events at work can be a blast when they’re organic and original, but they can just as easily be a drag when they seem forced and lame. We don’t get all of ours right at the Fool all of the time, but our batting average is way better than most. Check back here for more stories of some of the things we’ve tried over the years…your organization will be better for it. Thanks to my father who told me on the topic of this weblog, this webpage is actually amazing.